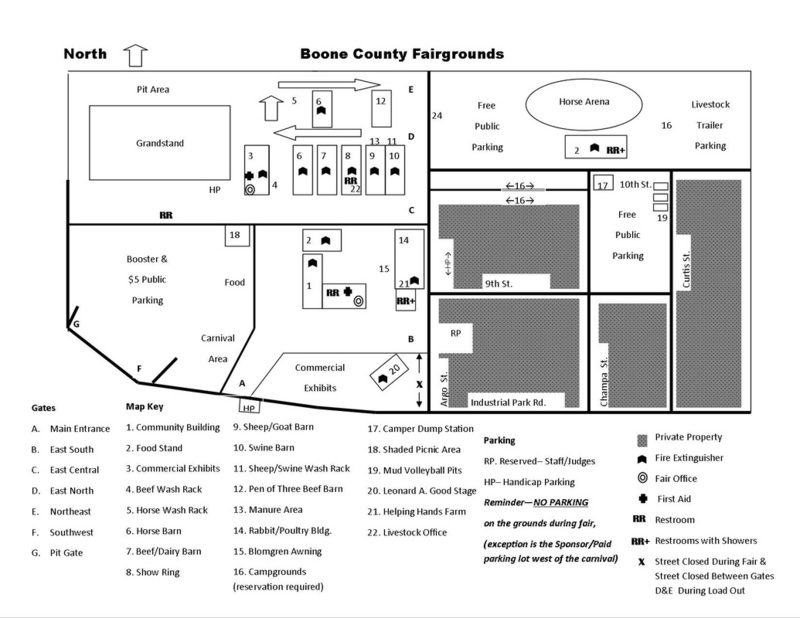 Everything you need to know about enjoying your time at the Boone County Fair is right here — hours, how to purchase tickets, maps, directions, first aid and more. If you have a question, chances are you’ll find the answer here. During the annual Boone County Fair, the fairgrounds are open to the public from 7:30 AM to Midnight. While the Fair is not in session, the fairgrounds is open to the public from during regular office hours, which are Monday and Tuesday from 8:00 Am to 3:00 PM and Thursday from 1:00 PM to 7:00 PM. Special Event Hours vary. Call the fair office for more information. The Boone County Fair prides itself on being a free fair! So bring the family and friends and enjoy the day! 1601 Industrial Park Rd. Boone, IA 50036. Free parking is available east of the fairgrounds. From Industrial Park Road, take Champa Street North. Parking area is east of Champa Street. Paid parking is available on the fairgrounds, through the west gate. Handicap parking is available on the south side of the fairgrounds at the main gate entrance. The Boone County Fairgrounds has nearly 100 electrical campsites. If you are interested in camping during the fair, please contact the fair office to get your name on a waiting list. For purchasing Grandstand events tickets, the Ticket Office is located on the south side of the Commercial Exhibits Building (near the grandstand). It will be open the week of the fair from 9:00 AM to 5:00 PM. If you wish to purchase tickets prior to that, you can do so online (see the attractions page on the website) or at the fair office during regular office hours. Carnival tickets can be purchased before fair through the ticket office, but during fair must be purchased at the carnival ticket office, located in the carnival. First Aid is located on the northwest side of the community building. During fair their is always certified medical personal on call to assist with any medical situations that require attention. When is the 2018 Fair? How do I sign up to compete in the Boone County Fair? Information on competitive events are posted on the Fair Contests page. How do I get a Fair Book? Guns are prohibited on the Boone County Fairgrounds; with or without a valid Iowa permit to carry unless authorized by the Fair Board as per Iowa Code. Failure to comply with this rule shall be cause for expulsion from the fairgrounds and/or being charged under Iowa Code. Grandstand & outdoor entertainment venues – stage areas, building porches and grounds attraction areas. Inside Buildings or Foodstands both enclosed and open serving areas, eateries and concession stands. Are pets allowed on Fairgrounds? Service animals assisting individuals with a disability are allowed on grounds. Also, animals being exhibited for 4-H and FFA projects are allowed, but must be id as such. Are bikes allowed on the Fairgrounds? No, bikes are NOT allowed. ATM's are located inside the Community Building and the Commercial Exhibits Building only during the fair. Lost and found is located at the Fair Board office which is located on the south side of the Commercial Exhibits Building. Where do I find a daily schedule of Fair events? The Fair’s Daily Schedule is available online - link on the main page of the website, or can be picked up at the fair office.